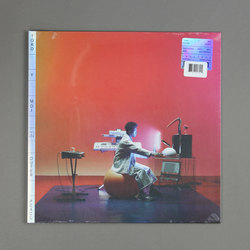 Toro Y Moi - Outer Peace. Vinyl LP. Bleep. Chaz Bear keeps up his busy release schedule with a new Toro Y Moi LP. Outer Peace is the follow-up to 2017’s Boo Boo, and the new album finds Bear building on the successes of that record. This is another sleek alt-pop success, one where Bear manages to balance retro thrills with contemporary production tricks. Many of the tracks here operate in the same hypnagogic synth-funk vein of many of Toro Y Moi’s contemporaries, and as such it’s no surprise to see an artist like ABRA crop up with a feature on the dreamy r&b joint ‘Miss Me’. Some of Outer Peace’s other numbers also demonstrate the influence of the leftfield pop sound of Frank Ocean, James Blake et al.